Google today launched a new networking option for large enterprises that want to connect their private networks directly to its cloud. These new dedicated interconnects, which are now in beta, allow businesses to set up a highly available, high-bandwidth network connection to the Google Cloud Platform for their data intensive or latency-sensitive services. This service goes a step further than Google’s existing solutions like its Google Cloud VPN service, which allows businesses to create a secure tunnel between their private networks and the Google cloud. Google notes that those connections have a capacity of about 1.5 to 3 Gbps and traffic obviously travels over the public Internet. If all of this sounds familiar, it may be because Google also long offered a service called Carrier Peering to give people a faster on-ramp to its cloud (to confuse things, this was previously called “interconnect…”). Google tells me that the major difference here is that a Dedicated Interconnect lets you create a network extension with private IPs and that it comes with an SLA. Carrier Peering provides peering of public IPs and doesn’t offer an SLA. 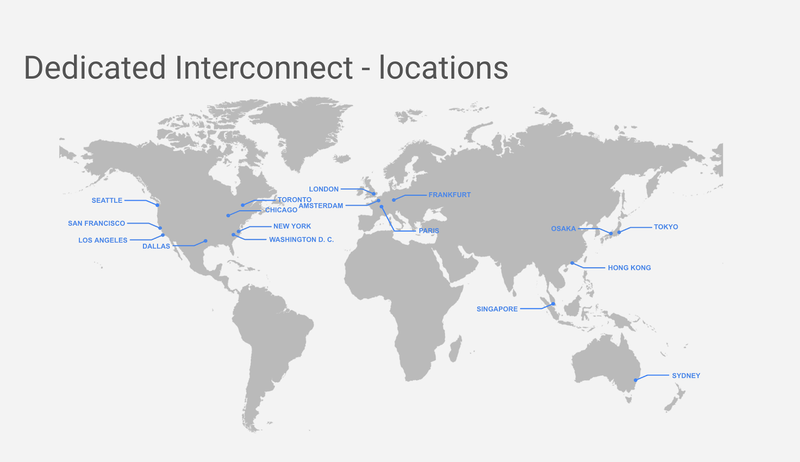 To use this new interconnect service, a user’s network also has to meet Google’s own network in one of Google’s supported co-location facilities (there are currently about 35 of these, with most of them in the northern hemisphere). Google offers enterprises a 99.9 percent SLA, as long as they run two interconnects for redundancy purposes. That number goes up to 99.99 percent with four links in two different metro areas. All of this obviously doesn’t come cheap. Every interconnect costs $1,700 per 10 Gb Ethernet circuit (with a maximum of eight connections). Assuming three connections and about 20 TB of egress traffic, that’ll quickly cost an enterprise over $10,000 — but then, if you’re the kind of enterprise that needs this, that’s probably not a lot of money to you.